Clockwise from bottom left, Genoa Keawe, Kenneth Makuakane, Amy Hanaiali'i Gilliom and Kealoha Kalama will perform at 8 p.m. today at Hawaii Theatre. The question has been percolating for years: Can women sing Hawaiian falsetto? Or is ha'i the female equivalent of what is called falsetto when performed by men? With Amy Hanaiali'i Gilliom returning to Hawaii Theatre tonight with Genoa Keawe, Kealoha Kalama and Leina'ala Haili as her guests, it seemed a perfect time to ask. Gilliom, Keawe and Kalama convened at the Willows earlier this week to consider the question. Hawaii Theatre manager Burton White and Eric Keawe, Auntie Genoa's youngest son, joined in the discussion. "When I was studying musical theory (in college), my voice teacher and I spent five years trying to smooth that break out," Gilliom said. Tonight's concert -- a tribute to the ha'i tradition, and the Honolulu debut of Gilliom's new band -- came out of a conversation she had with White about the Hawaiian falsetto tradition after Frank B. Shaner's recent falsetto contest. They wanted to take a closer look at where women fit in. "You read that men sing falsetto," White said, "but then you see a lot of women mentioned (too): Auntie Kealoha Kalama, Auntie Genoa, Auntie Leina'ala Haili, Myra English and Lena Machado. 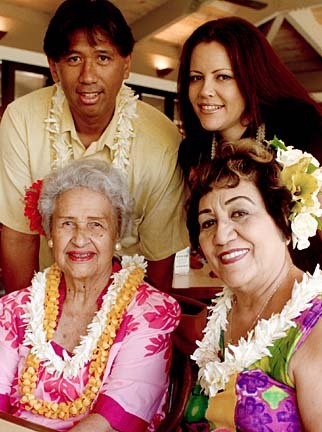 That was one of the reasons we decided we were going to get together and celebrate ha'i." "From what I've read, falsetto usually refers to men singing in a practiced 'head voice,' and ha'i is specifically the break," White said. "I think falsetto is for the males," Kalama said, sharing a story she'd heard about how George Naope informed a woman who had described herself as a "falsetto singer" that women sing soprano, not falsetto. "If you were mahu, you would sing falsetto." An older Hawaiian term for male falsetto singing (leowahine) carries with it an implication that the singers are trying to sound like women. Whatever kaona (hidden meanings) may have been associated with leowahine, the preferred term in recent years has been leo ki'eki'e i.
Gilliom uses ha'i specifically to describe what someone else might call "female falsetto." "It's the same thing, just a different name. I try and take everything from (Keawe's and Kalama's) albums, and Auntie Leina'ala, and apply it to how I sing. I try to stick to their style because that's the style." Keawe was a child when she became interested in yodeling -- a European-American style of singing that also utilizes the transition of the break between upper and lower registers, and was already well established here. "I decided when I grew up I was going to sing like that," she said, giving a brief demonstration of a yodeling technique that was a kissing cousin of ha'i. "Then when I heard Joe Keawe (a relative of her husband) sing (falsetto), I said, 'I can sing like him.' It was because of Joe Keawe that I really took to falsetto singing. That's how I started." "Ha'i is so important in your phrasing of your song and showing how you feel," Kalama said. "You can sing the regular tune, and then you add a little something to show how you feel." "The way I learned how to do that was by listening to their albums," Gilliom said. "That was the only way that I could feel what they were feeling, and you have to put your ha'i breaks in the right place." "Amy's already there (with her own style)," Kalama said. "Her voice is sweet, and when she does her ha'i, she does it so sweet," Keawe said. "I've told her, 'You've got the looks, you've got the figure, you've got everything.'" Keawe and Kalama mention Lena Machado, Rosalee Stevenson, Flora Waipa and Alice Wilhelm as women they consider as their forerunners -- "Lena Machado mostly," Keawe said. Eric Keawe feels that the ha'i tradition skipped the generation that falls between Kalama and Gilliom. Now it's picking up again, with Gilliom the inspiration for young women. In the meantime, Keawe has been sharing her knowledge with Eric's daughter, Amanda Pomaika'i Keawe. "She told me, 'Tutu, I want to sing like you,' so I told her, 'Every day, get my recordings, you sit by that phonograph and listen to those recordings,' and that's what she did." Keawe kept an ear open to her granddaughter's efforts. After a while she began correcting her granddaughter's mistakes and giving her tips on developing her vocal range and breathing. Pomai has no plans to record before she graduates from college, but when she sings "Alika" it's clear she is already a fine vocalist. "I feel so proud of her," Keawe said. "At the last concert we did, she was wonderful." "These aunties have been entertaining for so many years that obviously they're doing something right, and you want the same formula. If you can achieve that formula, you'll be entertaining your whole life," Gilliom said.